Chain was Yesterday….Carbon drive belt is today! The refernce according belt drive systems comes from Gates. A company who owns a broad belt portfolio mainly for industrial applications. Their product is called GATES Carbon Drive. This issue was already discussed at Bicycle Design. Dobbybrain shows a beautiful TREK bicycle. German magazin Aktiv Radfahren has a picture of Nicolai Argon TR bicycle. And finally the single speed guys from Karlsruhe / Germany try the belt. Intresting to see on all the frames is the possebility to open the rear dropout to put the belt into the frame triangle. Let´s see which version will be the future standard. All of them use the Gates system! Finally, here is one of the first available pictures which show the new Shimano Nexus Inter 3 Speed hub. Shimano product manager Florian Nebel sees trendy urban bike concepts, Crusiers and children bicycles as the focus market for this hub. Focus region is the USA! Source is the german bicycle Magazin ” Aktiv Radfahren “. See also this post about the first realized bicycle concept from Specialized with the Inter-3. 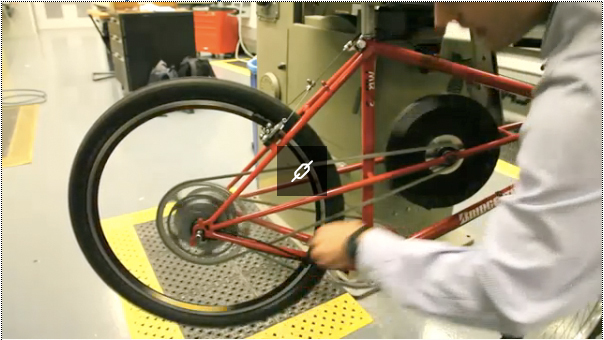 The swiss bicycle manufacturer KATZ-Bikes has one objective: Maintenance Free Bicycles! Here is the first concept for a maintenance free MTB. The drivetrain consists out of a Rohloff Speedhub in combination with a completely capsuled chain drivetrain. The rear wheel can be removed without touching the chain. This is realized by a special couppling between the internal geared hub and the rear pinion gear. The rear pinion gear stay on the bike and is a part of the drivetrain. – the chain has a wide overlapping on the chain wheel and the rear pinion by using to little guiding pinions. These two guiding pinions are on the untensioned side of the drivetrain with a low influence on the efficiency. The tensioned upper chainline has a straight effective direction! – the chain will be tensioned by the two guiding pinions (like a derailleur). 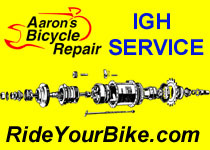 There is a whole bundle of maintenance free details on this bike concerning other parts. A price is not defined but the bikes will be available next spring. Phil´s veloblog is also discussing the benefits of this concept.